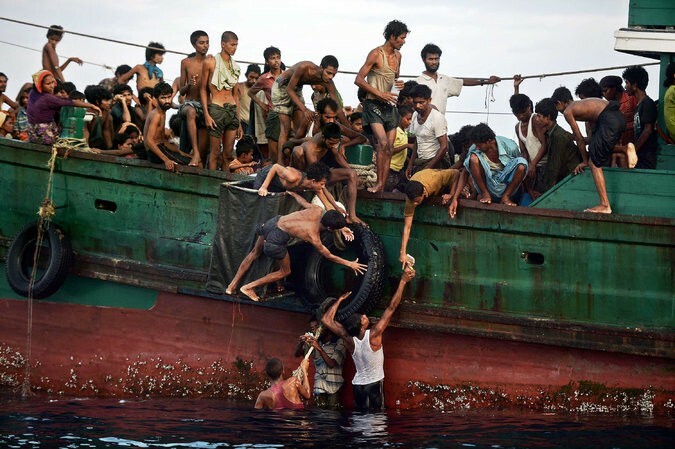 Is the US Positioning Itself for A Military Presence in Myanmar? Using the « Rohingya Crisis » as a Pretext? The International Crisis Group (ICG), a Brussels-based foreign policy think tank funded by some of the largest corporations on the planet, poses as a conflict management organisation. In reality, it introduces manufactured narratives that are then picked up and eagerly promoted across American and European media outlets, to shift public perception and pave the way for shifts in Western geopolitical aspirations. The Wall Street Journal and ICG both apparently expect readers to believe that Saudi Arabia is backing armed militants in Myanmar simply to “fight back” against Aung San Suu Kyi, her government and her followers’ collective brutality against the Rohingya. In reality, Saudi Arabia and its sponsors in Washington, London and Brussels, only intervene when geopolitically advantageous. Just as Saudi Arabia is backing armed militants everywhere from Yemen to Syria to advance a joint US-European-Gulf campaign to reassert primacy across the Middle East and North Africa (MENA), Saudi Arabia’s support of supposed militants in Myanmar is driven by similar hegemonic ambitions. At the core of the United States’ “pivot to Asia,” was always the encirclement and containment of China and reasserting US primacy in Asia. This is part of a much longer-term policy that stretches back as far as the close of World War II, the arming and backing of separatists in Tibet, Taiwan and the Vietnam War itself, as revealed in the Pentagon Papers. leaked in the early 1970s. The US “pivot” included attempts to overturn political orders across Southeast Asia which have (with the exception of Myanmar) failed. It also included attempts to push through the highly controversial and unpopular Trans-Pacific Partnership (TPP) free trade agreement which has also so far failed. And instead of reasserting American primacy in Asia, Washington has convinced many nations across the region it had hoped to use against China, to turn further toward Beijing for military, economic and political cooperation. Options for the United States are narrowing and it seeks to consolidate and expand in the few places it has seen success in Asia Pacific. This includes Myanmar, and exasperating the Rohingya crisis may serve as a possible vector toward doing this. With Washington’s oldest and closest ally in the Middle East backing armed militants aimed at inflaming further the Rohingya crisis, the perfect pretext for US military intervention has been created. Just like the US has moved itself into the Philippines under the pretext of confronting “terrorism” and has since proven itself difficult to remove, the US likely seeks to train with Myanmar’s forces and eventually base a contingent of American troops in Myanmar as well. Once this is done, it will be likewise difficult for Myanmar’s government, whoever may be leading it in the future, to undo it. Myanmar will find itself with another pressure point steering its policy in Washington’s favour and Beijing will find itself with yet another US military installation based along its immediate periphery. If the United States really wanted to assist their allies in Myanmar’s current government, they would take Saudi Arabia before the UN Security Council, denounce its backing of militants in Southeast Asia, and begin arranging a series of punitive political and economic sanctions. Instead, Saudi Arabia has enjoyed some of the largest US weapon deals in American history; billions of dollars in tanks, aircraft, munitions and training programmes, as well as unity in agenda everywhere from Yemen to Syria regardless of minor, superficial fallouts that may have been reported. For instance, the London Telegraph in an article titled, “US halts arms sale to Saudi Arabia over civilian casualties in Yemen,” would reveal that the “halt” only included certain forms of munitions, and that other arms deals were still underway. It also revealed that not only was the US still assisting Saudi Arabia, but was assisting them specifically in their war on Yemen. Saudi Arabia, which borders Yemen to the north, began airstrikes against Iran-aligned Houthi rebels in March of 2015. The US has offered military aide to the campaign, though the Pentagon insists its role has been limited. “As of today our assistance continues. It’s been very limited, consisting of refueling and limited advice on how to conduct strikes,” Navy Captain Jeff Davis said recently. Arming militants in Myanmar to create a pretext for direct US military intervention, likely in the form of joint-training with Myanmar’s troops and the permanent stationing of US troops in the Southeast Asian country, seems the perfect task for Saudi Arabia. The US, through its actions (and inaction) signals its support for this activity and very soon will likely signal to the world precisely how it plans on taking advantage of this manufactured crisis of opportunity. For the corporate-funded International Crisis Group, it has once again “introduced” a crisis that serves the interests of its sponsors and proposes a series of “solutions” that will only further work in Washington, London and Brussels’ favour and at the cost of everyone in Myanmar, regardless of which side of the current crisis they fall on.